Decked Out in Paradise:A few weeks ago we were at a place that many people think is paradise. This week we WERE in Paradise --- California. Paradise is just north of where our daughter Emily and husband Chad live in their new home. They invited us for visit and to be witnesses at their church's baby dedication and with big plans to build a deck on their house. We took a cruise through Paradise and found out where the locals find "Fast & Effective Pain Relief". So we stopped in to take our "medicine". 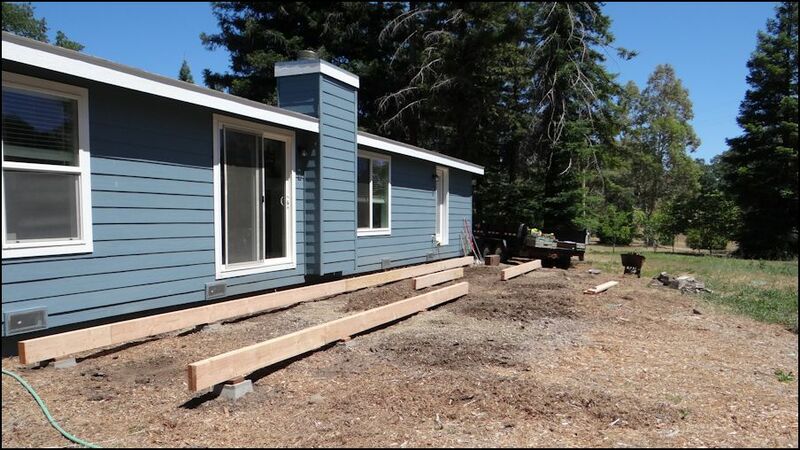 1) At Emily and Chad's house we surveyed the area where the deck will go. 2) Melissa also came to participate in the dedication of Micah and Zebulun and take photos. The girls (Melissa, Ellen, Mandy, Emily and Micah) relax the day before the dedication. 1) Pete's sister Donnalee also joined us for the dedication. 2) Mandy contemplates her role in this big event. The dedication at Oroville Nazarene Church was well received as Chad and Emily dedicated their wee ones to the Lord and all in the church committed themselves to helping in any way possible to guide them in their faith. Back home, it's time to get working on this new deck. 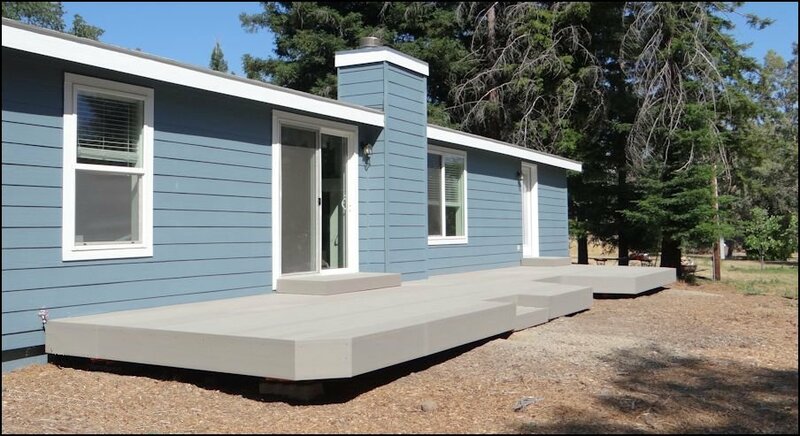 The deck will be a 10 x 44 foot deck using composite decking materials. Memorial Day was the perfect time to load up two trailer loads of material and get started. Mandy counts the boards to make sure we have enough. First off, remove the temporary steps to the house. Emily and Chad both got involved here as Grandma Ellen watches the kids. 1) Next dig 16 holes for the pier blocks and watch Chad tamp the earth for a solid foundation. 2) With all the holes dug, strings are drawn between the fence posts to provide leveling reference points. You probably thought this photo was of the corner of their house and that Chad changed his shirt from black to white to get in the photo twice. No! Miraculously these are two photos of the back wall, one from the East and one from the West. Amazingly, these unmodified photos taken a day apart, were shot randomly and yet the corners of the building are almost a perfect match. 1) The pier blocks were set into their holes and perfectly leveled to the strings you can't see! 2) Chad installs the first beam on the blocks. All the beams are in place and level and now we can have some long but easier days of putting up the deck. Now that the dirty work is done, Pete and Emily are willing to help out! (In reality Emily, Chad, Ellen and Pete helped everyday and just did not manage to get into these photos.) Each of the beams and joists were covered with window flashing to keep the moisture off these structural materials. Chad and Emily heard of this excellent idea and we can attest to the fact that the joists will rot on the tops over the decades. 1) Finally the first composite planking can be put into place. 2) Mandy's not impressed. Micah, always ready to help, grabbed her screw gun and adjusted one of the joists to make the deck perfect. 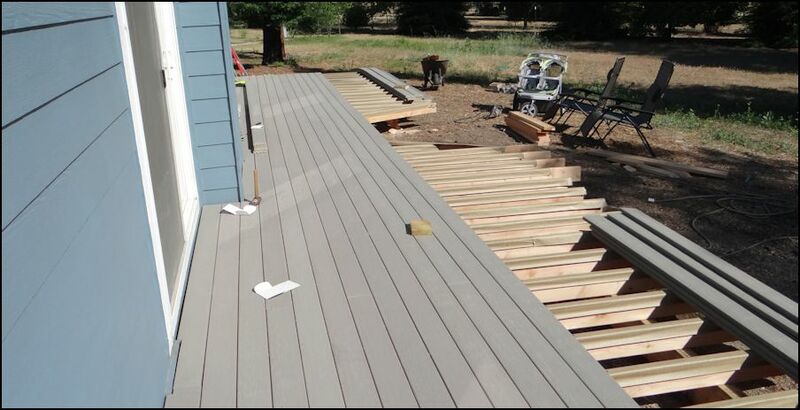 The decking is held in place by hidden fasteners. While the fastener cost is about four times that of screws, it goes quicker and exactly spaces the planks. And it is a nice clean look too! 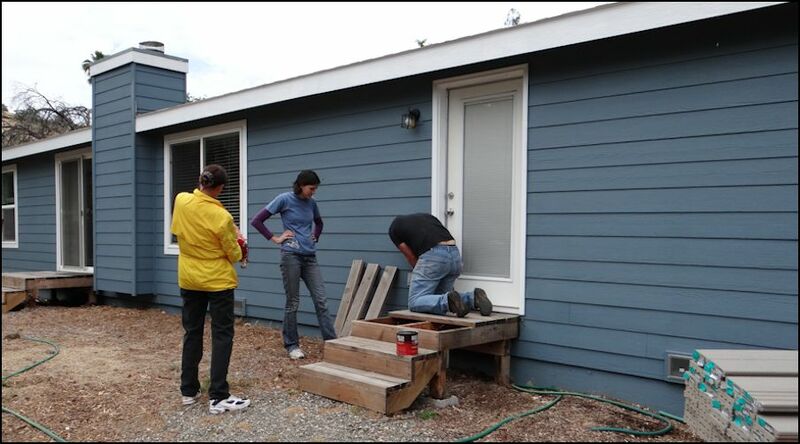 1) Emily builds the structure to hold the doorway steps. Pete and Chad work on the integrated step, the way down to the ground level. Once all the planking was complete, it took another day to attach the fascia boards. And the final product is a piece of art! A gorgeous deck that will give decades of pleasure with zero maintenance. Work is done and it is time for the family to enjoy the fruits of their labor. The cutout on the right is a seating area for half of the table that will be on the ground level, either on pavers or on a concrete patio. Yipeee. Another project! The visit is over and we head back to Atascadero for other family events. Announcing Big Rig Bible's Blog!